I used to make this salad a lot a few years ago, but I forgot about it until I was having some friends to dinner on Saturday and a large Jap pumpkin that need to be used up. This is the most fabulous winter salad, hearty and warming and a meal in itself if you want it to be. 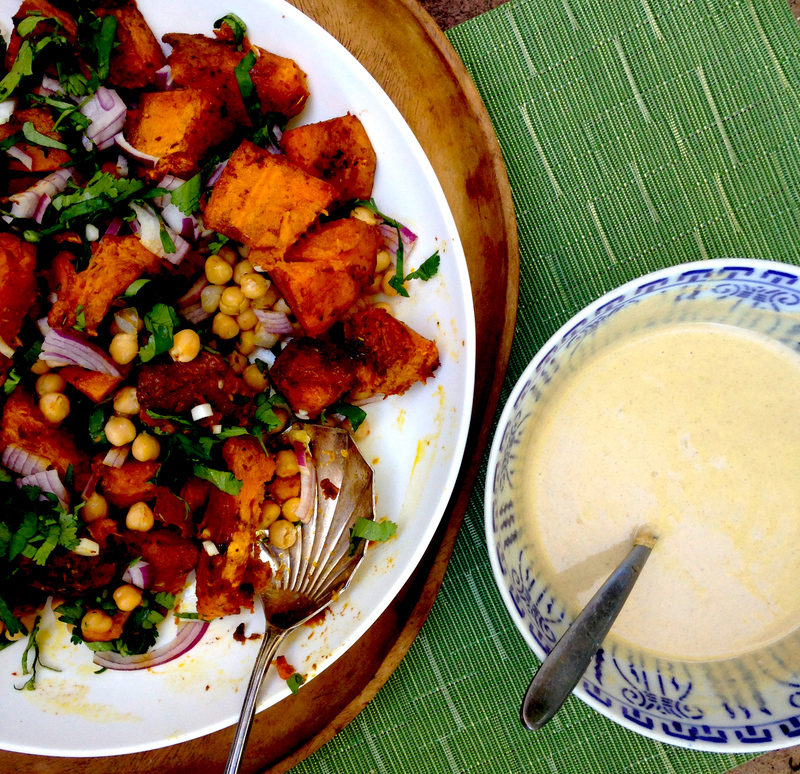 The tahini dressing is a traditional sauce used in Arab countries throughout the Middle-East. In its thinner pouring version it can served with falafel, used in tahini salata (a salad of chopped cucumber and tomato), drizzled over boiled or roasted cauliflower (or any kind of roasted vegetable). In its thicker version it can be eaten as a dip and served as part of a mezze plate. To make dressing mix together, tahini, olive oil and garlic together. Beat in some lemon juice followed by water, then more lemon juice and water until mixture reaches the desired consistency of pouring cream. The water will thicken the dressing and the lemon juice thins it. Taste and season, it should be quite tart. Remove from oven toss pumpkin pieces with onion, coriander and chickpeas. Dress with tahini dressing or serve dressing on the side. This salad can be served warm or at room temperature. If making ahead of time undressed salad can be stored in the fridge and reheated slightly in the microwave before dressing with salad. Leftover salad can be heated slightly in the microwave.